Does anyone know if it is possible to add a pigment to colour the durable resin? Has anyone had a go? Does it effect the properties? It’s certainly possible but also decently experimental. The problem with a lot of these dyes is that they fall out of the resin and settle on the bottom of your tank. I used glow powder with 50 micron particle size for this blog post.. With the correct ratio of glow powder, settling wasn’t too significant an issue. You’ll want to look into epoxy dyes for something that’s a bit more reliable and less prone to settling. If it’s an option, Durable also takes to primer pretty well and can be painted. I used glow powder with 50 micron particle size for this blog post. I didn’t realize those were your arms! Very funny BTW, I loved the egg beater wiper. Ya’ll just went from pigment to pancakes? Hilarious! I used RIT Dye to color clear resin a while ago. I do not have any Durable resin but it cant hurt to take a shot full of resin, dump in some dye and let it disperse. If the color stays suspended while the chunks fall to the bottom, you should be able to filter any pieces out and use the highly pigmented resin to mix into a vat of resin. This will obviously not make the resin opaque but I do not know the affect you are looking for. Thanks for the suggestion, that sounds like a good idea. I am looking to get a translucent colour so I think it will be effective. 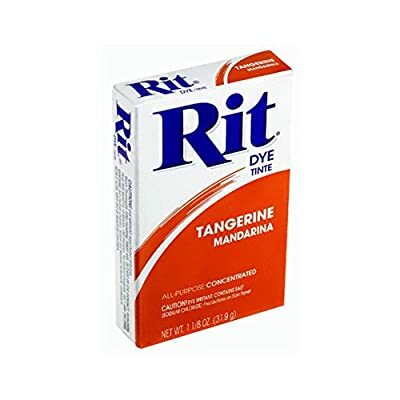 Did you use the RIT all purpose dye? Thanks for the reply. When you say that you have to use the correct ratio. How did you find out what was correct? I was planning on trying to colour match by controlling the amount of pigment I add, do you think this is possible? I had asked my wife to pick up powdered dye from the grocery store. I am not sure if it was the all purpose dye. Just be sure to get the powdered flavor as the water based liquid won’t play nicely with resin. My measurements were admittedly decently arbitrary. I kept track of how much dye was being added and started towards the higher end, iterating down until I reached a point where very little was falling out of the solution. A good method of doing color matching might be to use a CYMK esque system whereas you add black and white to darken and lighten things rather than modifying the amount of dye in the resin. How much transparency does stock Durable have? Any idea how thick the walls can get before you can’t make out general shapes on the other side? @DavidRosenfield you mentioned mixing Clear resin with RIT dye - at lower concentrations did the cured resin maintain some transparency, or did the dye pretty quickly make things opaque? I used the powdered version. I let the dye disperse into the resin. Very little mixing was done at first. 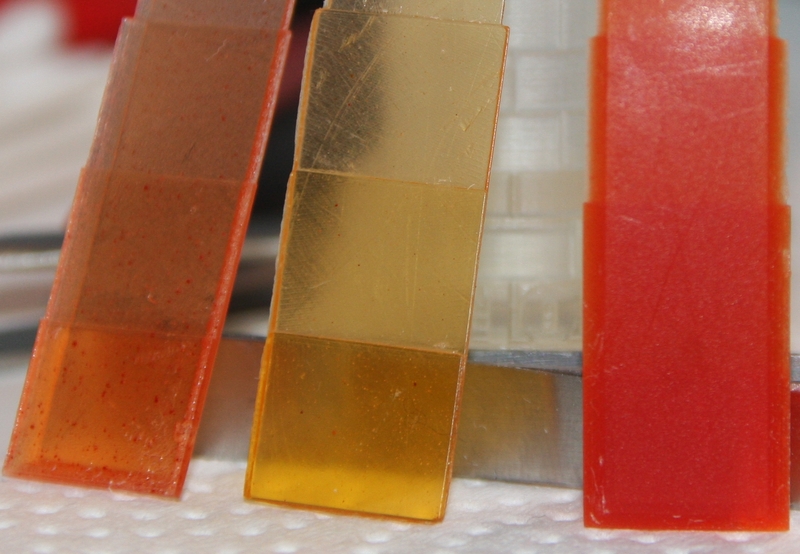 Then I separated the colored resin and the remaining chunks of dye at the bottom. Then I mixed it all together. I found anything much beyond transparent was too much color. The resin didn’t cure. The blue of the bottle openers is about as opaque as I could get before failures. The thread is around here somewhere. I tried playing around with the V1 white but the results were undesirable so I stopped and didn’t document much about it. Sorry. I got ahold of both products today (powder and liquid). The powder didn’t dissolve completely (maybe given enough time it will). But in a quick and simple test print, the liquid linked above worked pretty well. Super easy to stir into a nice, homogeneous mixture. I mixed in about 10% dye by weight, with Clear V2. That turned out to be too much dye, and came out more orange and opaque than I wanted. But that’s ok, my main interest for this test was whether it would work at all. I printed using Black V2 settings (to bump the laser power up a little since the cocktail is much more opaque than Clear). You can see the little dots of pigment in very thin walls (e.g. 1mm) but it’s fairly solid in thicker features (e.g. 3mm). The top surface is pretty tacky; I’m going to dunk in another alcohol bath and post-cure. The powder and liquid on the left is from the powder dye; the part on the right in the foreground is printed from the liquid mix. 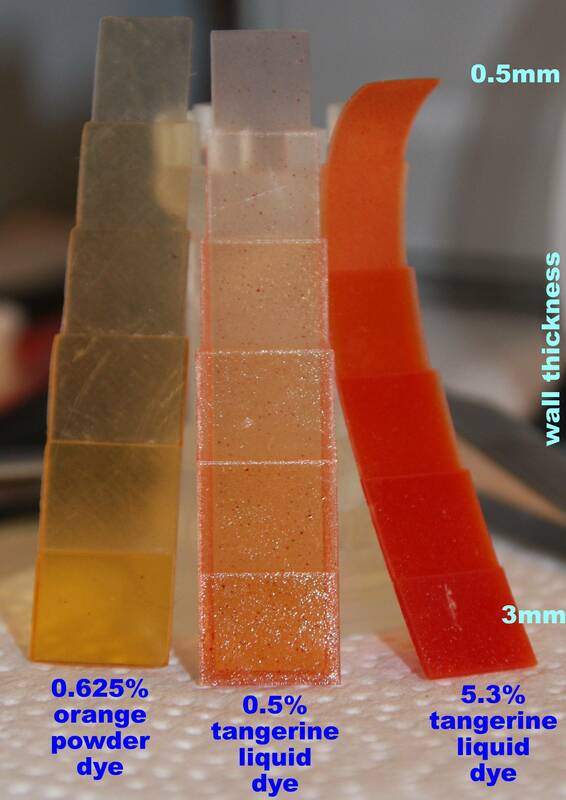 The wall size steps from 0.5mm to 3mm. When I used the powder, I think I let it dissolve for a week or so. Definitely not a quick process. I didn’t think the liquid would have worked so I didn’t try it. Looks like I should have. The dots in the thin part may be from the liquid as I didn’t see dots like that with the powdered flavor. But the powdered needs to have the chunks that didn’t dissolve removed. Yeah, even the liquid seems to have little pigment specks in it (although it’s possible some of that got picked up from my previous use of the tank for the powdered mix). I expect something like UV Monomer Nano Pigment Dispersions would result in much cleaner tints (thanks @Kevin_Grisko). My results did improve in both the powder and liquid mixtures by filtering. I used 226 micron paint filters, but I think a finer mesh would have been better still. My last test was with roughly 0.5% liquid dye concentration in Clear V2, printing under Clear V2 settings. If you trick the printer into thinking it’s stock resin, you can leverage the wiper and heater, which are really great for this kind of application (the dye prefers heated temperatures for better mixing, and the wiper helps keep the mixture homogeneous throughout the print) provided you monitor no splashing is occurring (at such low concentrations the dyes really don’t change the viscosity of the resin appreciably). EDIT: Note the wall thicknesses in the first picture are a bit misleading. I printed the powdered sample on a Form 1+, and the other two on the Form 2, both directly on base. I didn’t compensate enough for compression loss, so the actual thicknesses are 1.6mm to 0.3mm for the powder, 2.5mm to 0.33mm for the 0.5% liquid, and 2.55mm to 0.42mm for the 5.3% liquid. The curl in the latter is because I post-cured the part in a UV oven and didn’t bother to flip it. The ones printed with the Clear V2 settings didn’t come out as tacky and I didn’t post-cure them. So the bottom “brick” in the powder is roughly the same thickness as the third-from-bottom brick in the 0.5% tangerine sample (which helps explain why that sample looks so much more transparent). Also I printed the powdered sample at 200um and the other two at 100um layer height. The visible “margins” around the edges are because I chamfered them for easier release from the build platform. You can see what I mean in the second photo, where I accidentally photographed that curled piece backward (oops). I know I got a little off-topic here as the thread title refers to Durable, not Clear, but maybe this info will be helpful to anyone who stumbles across this thread in the future. I just got a bottle of the same dye and did the same procedure with the alcohol washes. I dipped the parts in a mixture of alcohol and red solvent dye for about an hour then light cured them. I guess I didn’t mix it strong enough because they came out pink. I am worried about the dye coming off the parts. Have you had that happen? I’m trying to figure out how to dye a general clear resin that has already been printed. This is apart of the post production. Wondering if theres temperatures I have to be aware of to not melt the cured resin. The cured resin won’t melt, but it might soften somewhat if you were to boil/bake it, until it cools down again. You probably shouldn’t need to boil it to color it, though.